Ostuni: that famously beautiful “White City” in the heart of Puglia, right down on the heel of Italy, is the subject of this photo blog. A few weeks ago, I visited Ostuni with fellow travel blogger Tom Weber, The Palladian Traveler. We were both completely hooked by the atmosphere of this most unusual and chic city on the Adriatic Coast of Italy near Brindisi. Come and stroll with us through its magical streets. First of all, the streets of Ostuni are paved with travertine and trodden on by a multitude of tourist feet. All those churches; wander the centro storico (historic centre) and see the Duomo and Bishop’s Palace…..
…and that’s just a start. There are lots of beautiful churches to see…..
……fronting Ostuni’s unusual houses, where the inhabitants go about their daily lives, apparently unperturbed by all that beauty……..
…whose beauty never fails to make one stop and wonder, made me reluctant to leave. We will return. 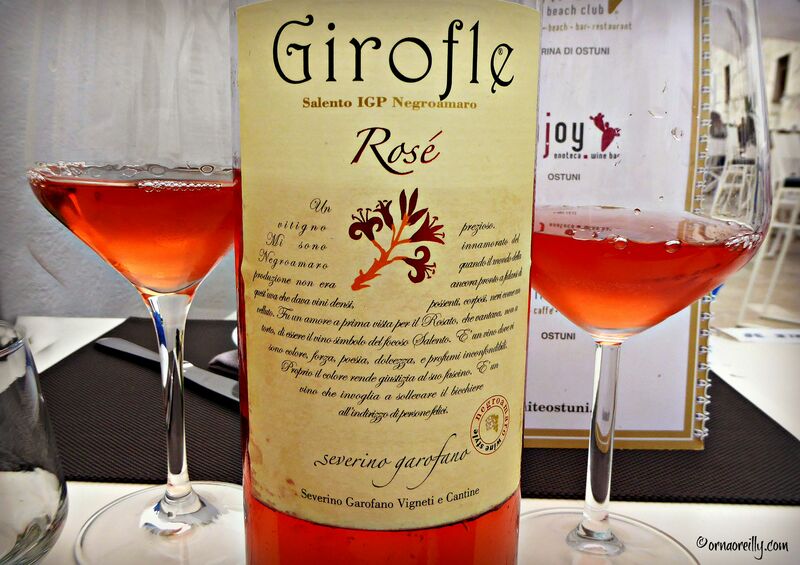 So, having strolled with us, let’s all stop and have a glass (or two) of the local rosato. How to get to Ostuni: fly via Ryanair to Brindisi and hop on the train. Ostuni is a city with about 32,000 inhabitants, including a lot of ex-pats. It’s well worth a visit. For Ostuni’s website click HERE. Cin cin indeed! It’s the most gorgeous city imaginable. Very nice post Orna. Brought back a lot of memories for me from my last trip. Love the ‘tourist’s feet’ photos! Thanks Susan. Tourists’ feet are quite different from those of the locals! Glad I brought back some good memories. We loved our visit to Ostuni. We stayed at a nearby agriturismo where we had some of the best food I have ever eaten. We stayed at an agriturismo too, but they only provided breakfast. However, we’re still talking longingly about those fantastic breakfasts! There was a restaurant on the property, but – though owned by the same family – was independent. Hi Ishita. You really need to visit Puglia on your next trip here. It is incredibly different from the rest of Italy, I think, and seems to be another world altogether. Very exotic. Love it there.